It is with great pleasure that we bring you this update before you gather with family and friends around your Seder table. 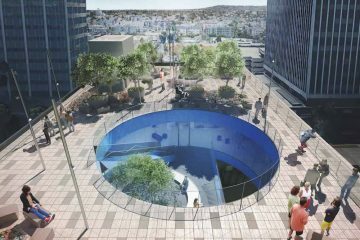 The Los Angeles Times published a story this morning about the final building of the Glazer Campus Master Plan. The plan was created 12 years ago and is almost complete. The news this morning marks the first time that an image of the new building has been shared publicly. In honoring our past and embracing our future, we have embarked on creating a gathering place not only for our own community, but also for the entire city. This iconic, modern masterpiece designed by Pritzker Prize-winning architect Rem Koolhaas/OMA will be called the Audrey Irmas Pavilion in honor of our generous lead donor. The creation of the Audrey Irmas Pavilion on Wilshire Boulevard is the most exciting physical statement and commitment we’ve made to the community since our sanctuary opened in 1929. Our ancestors who gave us our great sanctuary did not think small. They aspired to lead our community and our city with greatness and generosity. We will continue that visionary tradition with a modern masterpiece for all of Los Angeles. The building will feature one of the largest and arguably most dramatic banquet rooms in the city, along with beautiful meeting spaces, gardens, a chapel, and a rooftop terrace. Our members will be able to book both elegant and casual events including weddings and bar and bat mitzvahs with world-class culinary offerings. 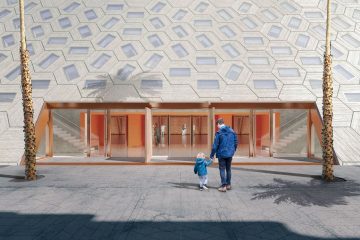 Working with the Karsh Center and others, we are also developing ways the Audrey Irmas Pavilion will be used for outreach programs for those in need, educational and cultural programs, and a place to gather for all in the heart of our multicultural neighborhood. In the coming months, we will be posting interesting articles about Rem Koolhaas and his architectural firm OMA, other important developments in and around the Temple’s immediate neighborhood, Audrey Irmas Pavilion donor stories and construction updates on our website. If you would like to receive more information about the Audrey Irmas Pavilion please contact Jamie Geller at jgeller@wbtla.org. You can access The Los Angeles Times article by clicking here and the Audrey Irmas Pavilion press release here. 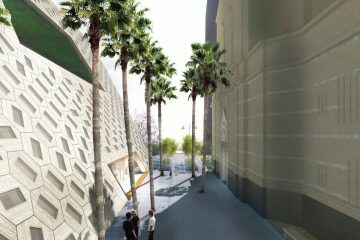 We all share in the honor of creating a gathering place of which the entire Jewish community and city of Los Angeles will be proud for centuries to come.